Many Lives, Many Masters details the author’s past-life hypnotic regression therapy with a troubled patient Catherine. Beyond her past-life memories, which are vivid and compelling, Catherine shows an ability to communicate with “masters” of the realm between lives. She also details impossible-to-know facts about author Brian Weiss‘s life, and picks horserace winners with stunning accuracy. Weiss notes distinct voices coming from his otherwise-mild-mannered patient, differing in style, tone, syntax, etc. If one believes this account, and Catherine’s connection with the in-between, she’s basically laid out the meaning of life for all to read. Our task is to learn. . . . By knowledge we approach God, and then we can rest. Then we come back to teach and help others. . . . The master spirits tell me. They tell me I have lived 86 times in physical state. Reincarnation, many lives, “master spirits.” The act of enlightened beings returning to help others suggests bodhisattvas are legit. There are many souls in this dimension. . . . There are many dimensions. I have been to different planes at different times. One one is a level of higher consciousness. . . . We all have abilities far beyond what we use. Some of us find this out sooner than others. Planes of consciousness. Supernatural abilities: healing? What else? We are given intuitive powers we should follow and not try to resist. Those who resist will meet with danger. We are not sent back from each plane with equal powers. Some of us possess powers greater than others, because they have been accrued from other times. Thus, people are not all created equal. But eventually we will reach a point where we will all be equal. We must also learn not to just go to those people whose vibrations are the same as ours. It is normal to feel drawn to somebody that is on the same level that you are. But this is wrong. You must also go to those people whose vibrations are wrong with yours. This is the importance in helping these people. We have no right to halt people’s lives before they have lived out their karma. . . . they will suffer greater retribution if we let them live. When they die and go to the next dimension, they will suffer there. They will be left in a very restless state. They will have no peace. They will be sent back but their lives will be very hard, and they will have to make up to those people that they hurt . . . Suggesting that even between lives, souls are punished for wrongdoing. Future lives will carry the “bad karma” that needs to be worked out. Catherine’s specificity suggests that she isn’t just assembling forgotten lessons from a childhood world religions class. From Weiss’s descriptions, this talk is completely uncharacteristic of her. Is it legitimate? More to come in another quote-happy post. Thanks to Bradley for the tip. ~ by Grant on July 18, 2012. My follow-up article to Dr Weiss’s book: ‘Fact or fiction: The girl, the hypnotist and past lives’. 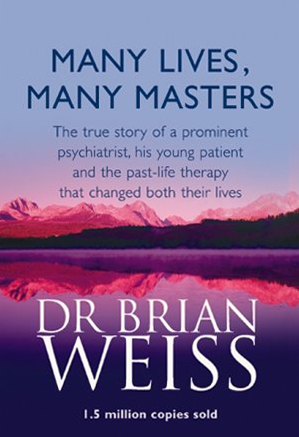 Dr Brian Weiss is a psychiatrist and self-proclaimed ‘scientist’ whose best-selling book, “Many Lives, Many Masters”, has apparently “scientifically proved” reincarnation by recounting the hypnotic regression to past lives by one of his patients. His book has sold over 1.5 million copies with rave reviewers mostly giving ratings of 4 or 5 stars out of 5. I give the book zero stars. I believe it’s a sham, pretending to be a work of scientific discovery when it’s nothing of the sort. The book gives doctors, and science, a bad name. The fact that so many readers believe that this book provides “evidence” for reincarnation shows that modern universal education has in many ways failed to properly explain the principles and discipline of science. Nice. The idea of other lives and other planes of existence reminds me of my experiences with lucid dreams. I often struggle with the idea of taking concrete “lessons” from dreams, the idea of somehow extracting information from the subconscious. It always seems to fail. The one recurring lesson I get from them is a renewed sense of awe. I have many times become aware in a dream and been struck by the awesome scope and detail and sometimes alienness of the scene, and thought to myself: no way I just made this up out of the random firings of my brain.